A multipurpose machine for everyone!! With two forward speeds and two in reverse, gear box with oil immersed gears in a strong steel housing, this is the ideal model for the hobbyist and the professional user. The quick reverse system with lever on the handles permits the user to change direction in a quick and easy way without using the clutch lever. The handles are adjustable and reversible and they permit to use the machine with front and rear mounted accessories. 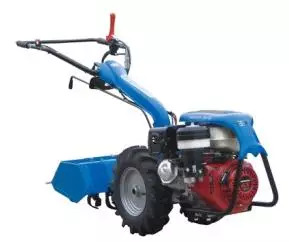 Many accessories can be fitted on this machine: rotary tiller, brush, mowing bar and many other useful and indispensable for your garden maintenance. Its small size makes this machine ideal for the work in greenhouses and inter-row cultivations.